Guide: Which Version Of Fire Emblem Fates Should You Buy? Fire Emblem Fates is out in Europe today, but picking up a copy isn't as simple a purchasing decision as it was with the previous outing, Fire Emblem: Awakening. 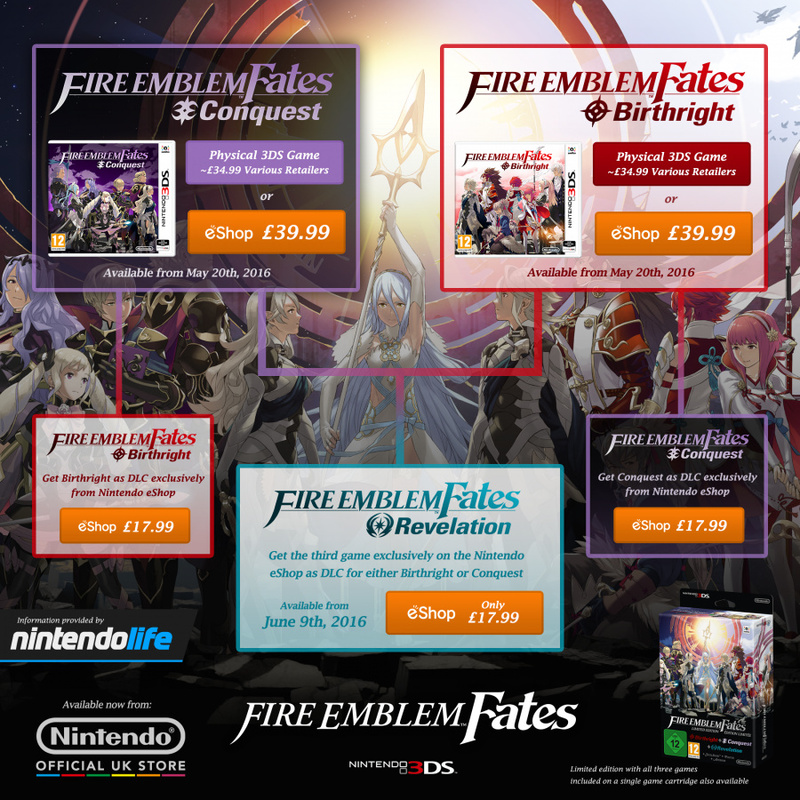 While that only had one version, Fates is divided into two retail packages with a third chapter coming on June 9th. Choosing which version is the right one for you requires a little forward-planning - not just for the fact that Birthright and Conquest offer very different experiences and challenges, but because Nintendo has different purchasing paths for you to explore. If you're a newcomer to the series or don't consider yourself to be a tactical expert, then the logical place to begin is Birthright. It's the more accommodating of the two "starter" versions, offering the chance to embark on missions outside of the main storyline in order to build experience and accrue gold. The mission structure is very similar to Awakening, too - you're generally tasked with routing the enemy, killing a specific character or moving to a particular part of the map. Should you be a franchise veteran or crave a sterner challenge, then Conquest is the best option. It limits your ability to take part in optional side missions and restricts your access to funds, which means you have to be very careful when levelling up your troops and spending money. It also gives you slightly trickier mission objectives to fulfil, making it a neat change of pace for seasoned Fire Emblem players. Unlike the Pokémon series, which also uses a dual-version format and shares a lot of content between each version, both editions of Fire Emblem Fates offer a contrasting storyline, different allies and exclusive troop classes. That means to really experience the full potential of the game's story, you need to buy both. While they are two parallel plots rather than two sides of the same story, playing both gives you a different perspective on events and characters. Both versions cost £39.99 / 44.99 Euros / $39.99 each. Thankfully, whichever version you choose, you can purchase the other version digitally at a reduced price of £17.99 / 19.99 Euros / $19.99. The third campaign - dubbed Revelation - isn't due out in Europe until June 9th and can also be purchased for £17.99 / 19.99 Euros / $19.99. If you were lucky enough to grab a copy of the limited edition package before it sold out, then you're in for a treat - you get all three versions of the game on a single game card, removing the need to worry about which one you should opt for. Considering the only fire emblem games I've played are Awakening and Sacred Stones, two of the supposed "easiest" fire emblems, I'm probably going to have to start with Birthright first. 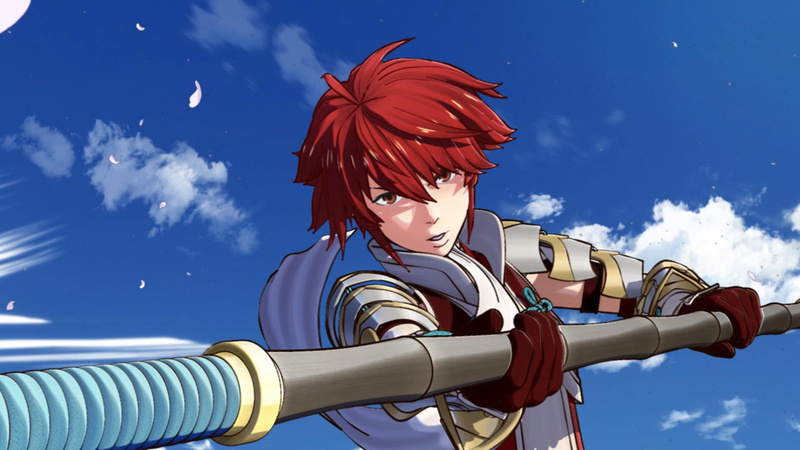 I am more interested in the mission variety of Conquest, but I think it's probably more sensible to go for Birthright, and then move onto Conquest. Got that limited edition so I'm set! I'll also end up getting it digital for my smaller 3ds! Wooop!! Wait, that ad you show makes no sense. Why in the nine hells are the eShop versions more expensive than retail? Shouldn't they be two thirds of retail? Nintendo still can't figure out this whole "pricing" thing? I hope you'll have fun playing Fire Emblem Fates. It'll change your life if you play all three routes. @BranJ0 Narratively they are really good. Birthright is a bit ho hum, but that is more due to it being a bit traditional with its narrative when it comes to Fire Emblem. If you have only played Awakening and Sacred Stones then it should not bother you and I would say the pacing is much better in Birthright than it was in Awakening. As for Conquest the story right out of the gate is really different and much more of a political affair. Lots of backstabs and emotionally heavy moments. Conquest does something rather different for a Fire Emblem story so it is a fair bit fresher than Birthright. Overall I think Conquest has the better story, but Birthright should not bother you too much if you are still new to the franchise. Additionally you can buy the other family's path and Revelations for 18£/20€ to get the other parts of the entire story. Fates is pretty much three separate games, and you only get all three in one package if you buy/bought the Special Edition. @DoctorOverbuild As you no doubt know with me by now. I aim to keep my Fire Emblem Fates - Limited Edition new and sealed and I shall be purchasing Fire Emblem Fates: Birthright and Fire Emblem Fates: Conquest seperately. And I'm just sitting here with the special edition on my shelf. Heh. There's still the question of which to play first though. I personally will play Birthright first; going by what I've heard and with Awakening and Sacred Stones being first FE experiences. I've since been playing through Fire Emblem GBA (awesome game so far), and I think that will prepare me for Conquest when I get to it. @DreamyViridi My Fire Emblem Fates Special Edition is currently in my cupboard with all of my other limited editions never to see the light of day again until it rises in potential value. I am also looking forward to the Tokyo Mirage Sessions #FE: Fortissimo Edition which I have also got pre-ordered. @BranJ0 Haven't played Birthright but as someone who's played quite a few Fire Emblem games and followed the game up until its release I can say that the story is... quite disappointing, to be honest. Fire Emblem stories are almost never particularly great (Path of Radiance's story was decent I suppose) but for the most part they're all the same level of inoffensively bland. I've read through a significant amount of Birthright's script and story and it seems to be on the same level as most other Fire Emblem games. However, while they tried to do something unique for Conquest, I can't help but feel it was a fair bit worse than the usual Fire Emblem story. Without spoiling anything, I can say that the characters just sort of all seem to act very irrationally and the main character just came off as a very badly written and annoying protagonist who never really does much actually good in the story. The plot twists also all seemed rather ridiculous, and the villain lacked any real interesting motivation. The gameplay of Conquest is pretty fun, but I wouldn't recommend either one of them for the story. It does fix most of Awakening's problems such as the pointless subplots being thrown in and not having a real consistent storyline or villain, but I feel like the story still managed to be even worse. @Tsurii I know THAT. The thing is, if you buy all-eShop, you're paying 5 pounds more, which is not an insignificant sum of money. Unless there's an eShop-specific discount or promotion other than the free theme, this MSRP is rather stewpid. The whole "but you get to choose!" angle won't work here as all this approach does is skew sales towards physical releases, destimulating Ninty from sorting their online services out. @Noelemahc oh, now I get what you meant. Yeah..Nintendo being Nintendo I guess. Outside of discounts I'd never get games with a physical release on the eShop. To be honest i'm not 100% which version they are selling in eshop. There is only one Fire Emblem Fates page and it asks money before even making me choose between Birthright and Conquest. I would've got birthright but it seems I'm over this game before it even came out. You took too long Nintendo. @DarkJamD My understanding is that you'll download both but one you reach the point in the story where you choose your path, you get locked into that version. From my experience, Birthright is very traditional but I didn't particularly enjoy anything about all that much outside of the remixed classes and weapons. Conquest is far and away the better version in every sense. The story breaks the fire emblem mold (somewhat) and the map/battle variety is the best in the series. If you're only getting one, get Conquest. If you're getting both, play Birthright first. It'll make you appreciate Conquest even more given the perspective changes. I bought both because... well, it's slim pickings for other Nintendoesque games this year for me. Got both from Smyths at £31.99 each (Explain to me why Nintendo uses GAME for it's exclusives when all their fans are queueing up in Smyths?). Playing Birthright first as a girlie, Conquest after as a bloke. Not sure what I'll do about Revelations yet. As someone who has tried and failed to get the Special Edition, it makes me cry that there are people who have it and will never actually open it. I totally understand the whole collector / investor mentality, but as someone who would have opened the package in order to play and enjoy the game as nature intended, but was denied due to stock issues, I can't help but feel like I've just been mugged by a large gang of thieves. I appreciate no-one does it maliciously, and it's really Nintendo to blame due to the stock shortages, but it still hurts. @gaga64 It probably won't last long but Game.co.uk as of this minute have the special edition in stock. I'm curious, has anybody ever or do you plan on playing through Revelation first even though the game recommends against it? Yay! I can't believe GAME actually delivered my special edition! Unfortunately, a lot of scalpers bought this package. Loads are for sale on eBay and Amazon. @cfgk24 As with practically everything Nintendo makes in limited quantities...I wish I could have gotten a special edition. Or you could get the Special Edition... in your dreams! Brother just texted me to say his special edition turned up this morning. Lucky sod. He's starting with Birthright, I'm opting for conquest first (when I can afford a copy, natch). I got the limited edition today! I do not buy to monetize in the future! But to warm my heart! @3792M @Wexter Thanks for both of your replies, it seems as if Conquest is the better of the two story wise, but that neither are really all that astounding in their plot. I can definitely live with that, and I still intend to buy both, but it's a bit of a shame that they haven't focused on the plot more to make the game even better. They still both look great, and it sounds like there is a lot of potential in Conquest's storyline, so I'm looking forward to playing them! @Noelemahc I think it's something to do with the EU market. RRP is £39.99 in UK, but retailers of the physical editions are able to price it how they please. Hence, the reason physical is more attractive in many cases. I don't think there is that flexibility in all markets. I've seen Birthright as low as £26. @Noelemahc It's not unique to Nintendo. If you go on the PSN store new releases cost full RRP whilst you can get them cheaper on disc elsewhere. I picked up Uncharted 4 for £36 and they want £50 on PSN. Though in fairness to Sony they do drop their prices down the line, quite a lot in some cases. You're paying extra for the convenience I guess, though I like having the box myself. @BranJ0 Skip Birthright. It got stale fast. And I'm in the minority but I thought the story, writing and vocal worked ranged from okay to obnoxiously weak. Fire Emblem Fates was pretty disappointing IMHO. @BranJ0 Better in every way, pace and the plot itself. And it's a good idea, Conquest sometimes reminds me of Radiant Dawn difficult, which is a bit harsh sometimes. That said to me Birthright have more appeal to me because of the new classes, which are all a blast, but Conquest mission structure is SO MUCH better. And Revelations is great too, but some maps are kind of dull. @Ogbert Nintendo also drop their prices down the line - The Nintendo Selects range are super premium games sold cheaper! I've played Fates (not Revelation yet). Here's what I recommend. Birthright for new players or Awakening Fire Emblem fans who haven't played previous entries. Conquest for everyone else- those looking for serious strategic gameplay. Don't underestimate this game. It's tough for real. Like, SNES Fire Emblem tough. BUT, veterans can still enjoy Birthright (just play on classic) and new players can still enjoy Conquest (just play on casual). Truth is the story and characters in Birthright is meh but has a spectacular last 5 chapters and ending. Conquest though, it has the greatest map designs I've ever seen. Truly remarkable maps. Little confused still - if you buy one game at retail are you allowed to download the other game at the lower cost? Or is the lower cost only for those who download the first game? @Bass_X0 Yes you can. Once you buy the first game at full price, physical or digital, you can get the other 2 as add on dlc for half price. Just note that the add on versions are pretty small (about 800 blocks each) and can't be played without your original cartridge. @Bass_X0 Forgot to mention that you likely can't get the half price deal through retailers, you have to go through the in game "Explore Fates" option in the main menu and use either your credit card or eshop credit. @Shogun474 I would quite like to play all three games, if anything just to get the complete story of the three, but it's interesting that you think parts of the game are very weak. What about fates do you not like compared to other fire emblem games? @Frank90 Yeah, it seems that both games have their pros and cons, with the cons of one game being the pro of the other. So it seems like the best thing to do is to play both! @3792M Agreed. Revelations, however, is better, due to the narrative being about convincing the two sides to work together (and all of the fun character conflicts that come with it) instead of being cliché like Birthright and tropey/trashy like Conquest. I would say get Revelations when you can, and don't bother too much with Birthright or Conquest unless you're a completionist. Revelations is truly the whole package, a true Fire Emblem experience. It has the most well balanced gameplay experience, the actual battle maps aren't just all about using a few favorite characters to overpower your opponents with no strategy needed other than terrain/choke point camping/crawling with front liners and finishing off with back liners (which both Birthright and Conquest are guilty of in different ways), the best story/plot, you get all the characters to play with instead of just some of them, all of the castle features, and of course, actually has a real ending. Birthright and Conquest's endings both have the same ultimate result, they both have a lame ending that basically just serves as an advertisement to buy Revelations for the canon ending. So yeah.... Just go for Revelations when you can, and don't bother getting both Conquest and Birthright, unless you're a completionist. If you got the special edition, then congratulations, you're one of the lucky few who has a physical version of the only good path in Fates. Edit: I take back that last sentence... I mean great. As in Conquest and Birthright have good gameplay, but Revelations is even better. @JaxonH Nah, I'd still say Thracia 776 had more interesting map design and higher difficulty than Conquest on Classic/Hard. (Lunatic is just a numbers game that shoehorns in an uneccessary emphasis on the luck element, not a true difficulty increaser.) Even the opening stage requires one to not be careless. The Fog of War maps are all unnerving. Especially in the castle stages, Thracia 776 can get scary very quickly without careful progression, with the threat of thieves stealing your gear becoming a threat to even your most powerful units. It's basically the NES Ninja Gaiden of FE. Conquest recalls the way some Genealogy of the Holy War maps were used, but lacks the objectives variety, geographical planning, and huge map size/high unit count. One map scenario (after the first one) in Genealogy can take about as long to complete as two or three chapters in Fates. The terrain/choke point camping/creeping that sometimes made sense, but wasn't always optimal, worked in Genealogy because of the huge size of the maps that can span across a country. Conquest doesn't have this huge scope, so the same tactic just ends up being utilized as the de facto way to build a few elite units, making it easier to abuse than in Genealogy. I never liked the huge sized maps. It took forever trying to cross it. I prefer nice big maps, but not that big. Conquest has some pretty huge maps though, all things considered. Just right imo. But ignoring Lunatic, or even Hard, Conquest is a tough game even on normal. But I really disagree with regard to the map design and objective variety. From the map that has you identify the disguised ship captain and defeat him (from 4 possible candidates spread across the ship) to defend maps, escape maps (and even all units deployed must escape), sieze maps, defeat the boss maps, route the enemy maps, survive X turn maps... and many with 2 objectives. Maps design was unquestionably superior too. Like this one where you use dragon veins to open half the rock gates and shut the other half, which made for some very interesting gameplay with your units being split up. Or this one where the wind blows you across the map, with dragon veins influencing the direction. I'm not knocking previous games but... you have to at least admit the genius of Conquest even if you think Thracia was better. Also, I really, REALLY loved this defend map. I didn't have as hard a time with it as everyone else seemed to (I reclassed Nyx as an archer to man the second launcher and used a Dread Scroll for Mozu who was already in beast mode by this chapter). But it was just fantastic fun. The map may not seem like much to look at from a screen shot but playing it? Ah man, it's laid out brilliantly. @JaxonH Very nice image posts! Yes, I agree that overall, the gameplay of Conquest is by far it's best aspect, and it does have a neat twist on the branching routes on maps. Gameplay is what matters most in games, so getting past everything else, that's ultimately what matters most. I'm glad Nintendo and Intelligent Systems brought back the difficult style of Fire Emblem. I'll admit, they goofed up by bringing on that anime writer. They THOUGHT it would improve the story but in actuality, it's far worse. Makes me wonder how such an intriguing premise (and let's face it- the story premise is brilliant) could be messed up so badly. In Awakening when ******* jumped, you felt it. You squirmed in your chair. When Ch. 10 brought the raining map and emotional music, the events prior sunk in even more. Yet with Fates, you didn't feel it in Ch. 6 like with her. Why? Because they barely introduced the character before the tragedy occurred. How can you mourn for someone you only just met? And Fates far over-uses Corrin crying. It feels LESS emotional when they try to hard to make something feel emotional. This was my biggest dissapointment. The internal team did far better story and writing than this "professional" they brought on board. People actually complained about Awakening's story but I thought it was the best of any handheld FE to date (lest we forget these are handheld entries and cannot/should not be held to the same golden standard of a fully fledged console title- although Awakening was so good, some started comparing it to console entries which then gave them ammo to point out shortcomings). But that aside, it's not a disaster. It's just, very average. Story wise I mean. But the gameplay is so good I can look past all that. I mean, the GBA FE are not even close to being as good as Fates story so I suppose I can't complain. But ya, gameplay is the name of the game and it has that in spades. I do hope the next one will be internally written though. Because when you have compelling story AND top-shelf perfected gameplay, you end up with a classic like Valkyria Chronicles. @Fynnez13 If anything, the best choice would be Conquest if only because leaving your adoptive family with their abusive psychopath dad and then killing the lot with the guys that try to kill you when refused seems really off considering how much Corrin hates killing and all that. Two things of note, most classes can be reclassed into by someone on each side from the other side's classes so classes aren't too exclusive. Of course you can only have a handful of your forces classes from the other group at a time. The other is Birthright has one hard chapter trick of note, so don't expect a total cake walk. @BranJ0 - Conquest made me feel I finish a book and knew everything I needed to be satisfied with what I read, it felt complete. Birthright felt like my copy of "The Three Musketeers" (Which has entire pages blank and chapters, made it an awful read) I felt like I followed through but I missed things and didn't feel like I read a whole story. Of course I did play Conquest first so maybe in the reverse order Birthright wouldn't have seemed as bad and felt as it did. Also no strange out of place Valm story chapter randomness in any of the three paths. @Giygas_95 - I debated doing that but held back from it in the end, starting with Conquest. @Fynnez13 - Honestly I'd likely go Conquest, there is nothing to set up any trust for me or care in the intro for Birthright.